MGM (branded with United Artists, and originally made by “Mid Century Productions”) very recently “finally” released the DVD of the famous campy b&w 1951 sci-fi flick “The Man from Planet X”, all of 71 minutes, directed by Edgar Ulmer. Mostly set in Scotland, a mysterious planet approaches and threatens collision with Earth, and a spaceship with a small robotlike doe-faced humanoid lands. Perhaps its rays can turn the curious into zombies, and perhaps the planet is looking for a new home for its beings. Of course, a rogue asteroid really might threaten Earth, but an earth-like planet making it here from another solar system with beings on it is pretty unlikely. In the early 50s, a Saturday morning kids’ science fiction series “Space Patrol” hypothesized an Oort Cloud Planet X ten times the mass of Jupiter. Such an object would be a brown dwarf (as in ABC’s film “Impact”). Attribution link for p.d. 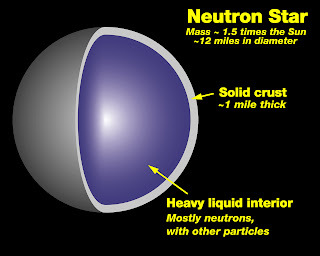 NASA diagram of a neutron star. Look at this NatGeo video on rogue planets, or "planemos", here. Alfred Hitchcock's silent film "The Lodger"
"She's the Man" aka Shakespeare's "Twelfth Night"